� In 2010 Ross became the first player to win both the FIVB Junior (U19) and Youth (U21) World Championships in a single season. � Ross and Natalie Hagglund, ages 16 and 17 respectively, became the youngest team to ever qualify for an AVP main draw when they did so at the 2009 Manhattan Beach Open (since eclipsed). � In 2008 Ross and Jane Croson became the youngest team ever to compete at the FIVB Youth Championships. � In 2011 at the age of 19 Ross played in her first FIVB World Tour event, losing in the country quota. Since then she has qualified in all six of the times she has had to play in the qualifier. � In September 2012 Ross partnered with Emily Day for the first time in the World University Games in Brazil and went undefeated in winning the title. In November 2012, the pair played together in a NORCECA event for the first time and the duo won. And in September 2013 they competed in their first AVP event as partners and went undefeated. 2018: Ross and Sara Hughes played four AVP tournaments together, reaching the finals each time and winning twice. The pair won its first 14 matches to begin its domestic partnership. Ross led the Tour in blocks (1.27 per set) and kills (9.34 per set) while being second in hitting percentage (.510). On the FIVB Tour Ross played three times with Brooke Sweat, winning a bronze in a three-star and a Major event. Ross played 10 international events with Hughes, winning a gold and a bronze in four-star events. 2017: Ross and Brooke Sweat teamed up and played four AVP events together, winning once and finishing second twice. Ross finished the year ranked second in kills (7.74 per set), fourth in hitting percentage (.468), fifth in aces (0.93 per set) and sixth in blocks (1.00 per set). Ross and Sweat played eight FIVB tournaments together, winning one silver and placing fourth in another event. 2016: Ross and Lane Carico played six AVP events together, winning once, finishing second twice, and placing third three times. Ross was third on the Tour in blocks (1.01 per set). Internationally the duo played 13 times on the FIVB Tour, with a best of fifth. 2015: Ross formed a partnership with Lane Carico and in their first AVP tournament together they placed second. The duo was third in their other two domestic events together. Ross was third on the Tour in kills (6.90 per set) and hitting percentage (.459), and fourth in blocks (1.08 per set). Internationally, Ross played six times with Jennifer Fopma, with a best of fifth. Ross and Carico also played six FIVB events together, with a best of fifth twice. 2014: Ross and Day advanced to the semifinals in four of the seven AVP tournaments, with a best of second. Ross was eighth in hitting percentage (.422) and ninth in kills per game (6.58). The duo played 10 FIVB events, with a best of fifth and finished the season as the second highest ranked team from the U.S.
2013: Ross teamed with Emily Day for the first time on the AVP and the duo became the first ever team to go through the qualifier and win the event. They reached the championship match in each of their first three AVP events, with three different outcomes. They won, then placed second, then tied for second as the finals in St. Petersburg never occurred due to weather. They ended the season with two third-place finishes. On the FIVB Tour, Ross played once with both Brittany Hochevar and Kelly Schumacher. She partnered with Day in seven FIVB tournaments, placing 17th in the World Championships in Stare Jablonki and concluding the season with a silver medal in Phuket. 2012: Ross played in three FIVB opens with three different partners, playing in the main draw each time. Ross had two best finishes of 17th, with Nicole Branagh in the Berlin Grand Slam and with Hughes in the season finale in Thailand after advancing from the qualifier. Ross won two Norceca events, one with Emily Day and one with Tealle Hunkus. Domestically, Ross played four events with four different partners, with a best of ninth. 2011: Ross and Roenicke lost in the country quota of her first FIVB open tournament. 2010: Ross played in five AVP events with three different partners, advancing from the main draw in four of those with a best of 13th with Croson. 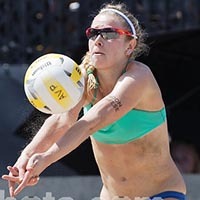 In each of the main draws Ross lost to top-seeded Nicole Branagh and Misty May-Treanor. Ross won two FIVB youth events, the Youth World Championships with Croson and the Junior World Championships with Roenicke. In those two events Ross and her two partners won all 14 matches, dropping only five sets. 2009: Ross and Natalie Hagglund advanced from the qualifier in the Manhattan Beach Open. Ross also played in one other AVP qualifier with Croson. Ross finished fifth in the U21 World Championships with Jazmin Machado. Ross and Tara Roenicke won the gold medal at the Australian Youth Olympic Festival in Sydney. 2008: Ross played an AVP qualifier with Caitlyn Murphy at the age of 15. Ross and Jane Croson finished ninth in the FIVB Junior (U21) World Championships in Great Britain. College: Ross started her indoor career as an outside hitter at the University of Washington. She transferred to Pepperdine and won the first ever AVCA Collegiate Sand Volleyball National Pairs Championship with Caitlin Racich in 2012. Personal: Ross has a brother, Chase, who also competed at the FIVB Youth World Championships in 2008 and 2009.